Vacation rental townhouse. Sleeps 7, 3 bedrooms, 2.5 bathrooms. No pets allowed. Winter view of the outside of the townhouse. Winter view from the back deck. Living room with wood burning fireplace and television. Dining area with seating for six plus three at the kitchen counter. Master bedroom with queen bed and television. Upstairs bedroom two with queen bed. Downstairs bedroom with pyramid (twin over full) bunk bed set. 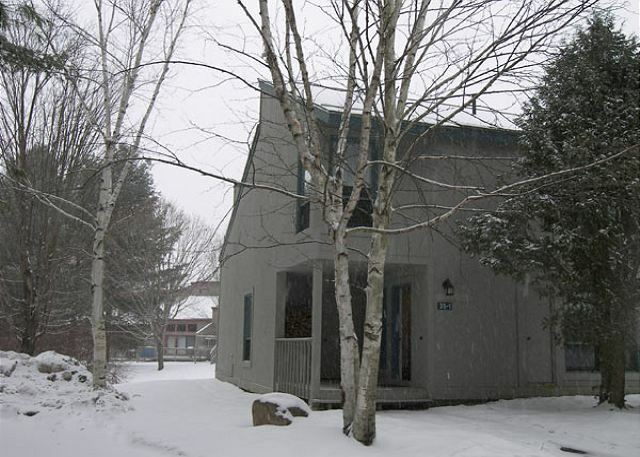 A two-level, three bedroom, 2.5 bath townhouse in Lincoln Station Resort just over a mile from Loon Mountain in one direction and downtown Lincoln, NH in the other direction. Enter to the main living level with open concept living room, dining area and kitchen. The living room offers a television and wood burning fireplace. The dining area seats six and offers access to the spacious back deck. The full kitchen has counter seating for an additional three people and offers a microwave, dishwasher and stove with self-clean oven. 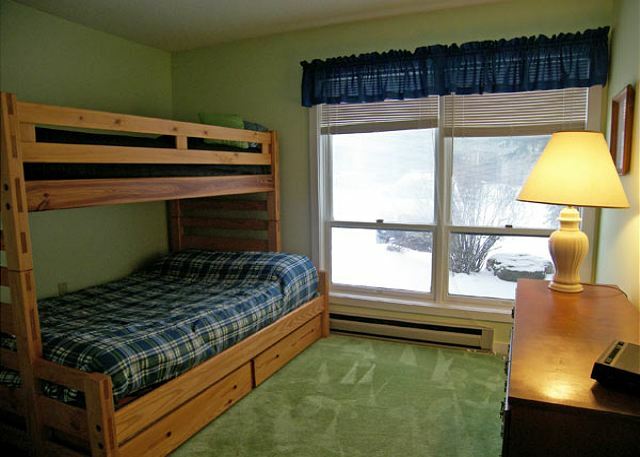 Off the kitchen is a bedroom with a set of pyramid (twin bed over full bed) bunk beds. The half-bath is also located on this level. 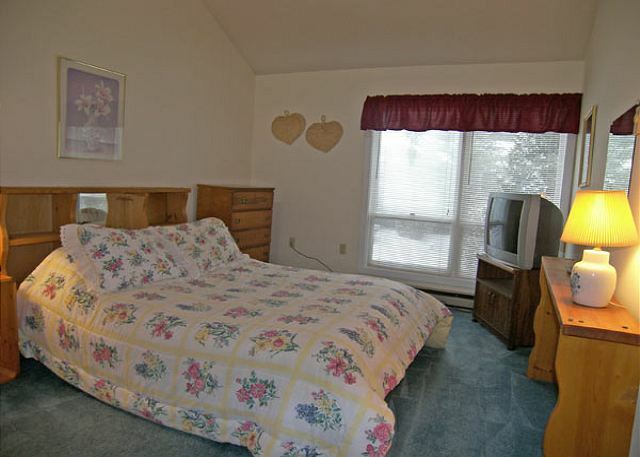 Upstairs you will find two bedrooms each with a queen-size bed, air conditioning and full attached bath. There is also a laundry closet located on this floor with a stacked washer/dryer set. Lincoln Station offers a health club membership with indoor pool and tennis courts available. Weekend and holiday shuttle bus service to Loon Mountain Ski Area in season. 84 % of our reviewers would recommend this vacation rental. Had a wonderful time. Condo is dated but cozy and nostalgic which I like. It was very clean. Maintenance man was very helpful and accompdating (problem with getting TV on) and he ensured we had what was needed to start our fireplace. I love the location and club house. Wish clubhouse closed a bit later - like 10pm like most surrounding accommodations do. . Only minor issue was plumbing which is very old and loud (upstairs shower piping sounded like a jet taking off and upstairs toilet plumbing very old). Upstairs bedroom was advertised as having a TV and had no TV. Overall, it was was enjoyable and will stay again. a guest from Miami, FL does not recommend this vacation rental. The unit was attractive, well located and accessible. The bedroom with bunk beds was located on the main level off the kitchen and great room. The other two bedrooms are upstairs and the distance from the children could be a problem. 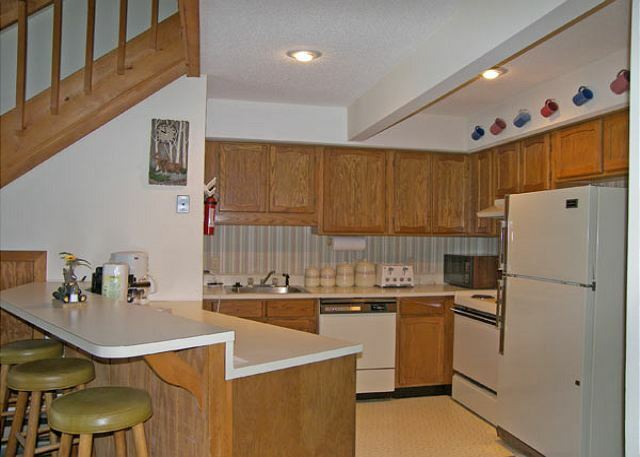 The kitchen could use updating, in particular the pots and pans are old and larger pots were missing. The light in the unit was lovely. The old vcr unit did not work. All in all, I felt the rent was high for that particular unit. a guest from Northborough, MA does not recommend this vacation rental. Overall we had a great stay, but I would say this unit needs some serious upgrades. I grew up in the 80's so I can appreciate they decor, but I would think it's time to bring it in to the 21st century. A flat screen TV with a DVD player would go along way. Thank you for your comments. We will bring them up to the homeowner. a guest from Nokomis, FL does not recommend this vacation rental. The snow was wonderful and plentiful. It was more like "winter" conditions. Loon certainly does keep the mountain in great shape. We're glad to see that you enjoyed the snowy conditions this year! But we are a little surprised by your ratings. Could you tell us the differences between last year and this year? Yes, the decor is dated, but this condo is very clean and has a great location. We were pleased with the large living room and the very clean kitchen and bathrooms. It is close to the pool and rec center (which themselves could use some cleaning) and to Loon mountain. Beds were comfy, appliances and fireplace worked well. This condo is very well situated, near the swimming pool and within walking distance to shops and restaurants. There was an ample supply of firewood and the living area was comfortable and clean. Working with Loon Reservation has always been a pleasure and we had a wonderful time. Loved this condo! It was beautiful, spacious and clean. Will definitely stay here again. Fun and comfortable. A fitness center would have been nice and the pool area was dark and cold. We really loved it. The place was beautiful and convenient. Our only suggestions are a larger, flat screen tv and perhaps one king bed upstairs. Overall, we were incredibly comfortable and it was a joy being there. When we arrived we were very pleased to see that everything was lovely. The place was very clean. The first night we tried to take showers but had no hot water so the next morning we tried again and still no hot water. Maintenance came over and flipped a swith and said in a couple of hours we should have hot water. Honestly that was an inconvience because we had to wait a couple of hours for the hot water to kick in. I would have felt better if some kind of little offer was made for the inconvenience. Due to a personal matter back home we left early on the 29th. We had originally planned to stay until the 1st. Perfect! We look forward to staying at this location again. Had a great time great location the only problem we had was the fridge did not work very good. Such a beautiful home away from home!!!! Glad that you a great stay! Plenty of room, very clean, great location! Only downside, no wifi. I was very impressed with this condo. It was the perfect size for our party of 7. Very cozy with a wood fireplace. Perfect location to loon mountain to ski. We're happy that you all got to enjoy it! We have stayed at various places in Loon, for the past 6years. This is the best place for us. We will definitely return. We're so happy to hear that, and look forward to seeing you again! Happy to hear that you had a great time! We do ask owners to add Wi-Fi, as many guests ask for it, but it is voluntary. Excellent spot for a weekend of skiing at Loon!! Would definitely rent this condo again!! So glad to hear you enjoyed your stay, and we'll look forward to seeing you again!